I hate to admit it but my house used to be a mess! Nothing had a home, and every drawer was disorganised. 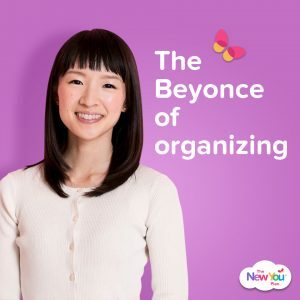 A few years ago I read a book that started a new journey for me and now I am a big fan of Marie Kondo, the Japanese organising guru. 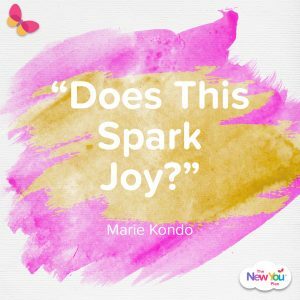 Marie Kondo’s book is called “The Life Changing Magic of Tidying Up” and it has helped thousands of people to clear the junk out of their home and live in a place that sparks joy! When I read the book I was so excited to realise that this highly successful Japanese tidying up method was based on exactly the same principles as our successful New You Plan TFR Diet. I think when you are on a TFR diet, you have so much energy, and so much determination to change your life and create your new you, that paying attention to your environment and how it makes you feel, is a great way to complete your transformation. I would highly recommend you buy the book. It is a quick and easy read and very inspiring! Imagine the change you can bring about in your life if your house was in complete order, and you were at your healthy target weight? WOW! 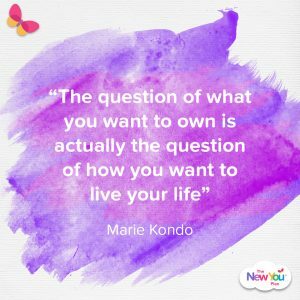 It can be done, and the best part is the principles of the Marie Kondo method and The New You Plan TFR Diet are exactly the same. Marie says that people who take this approach of just doing one drawer a day, rarely get the job done. She says that changing lifestyle habits acquired over the span of many years is often very difficult. 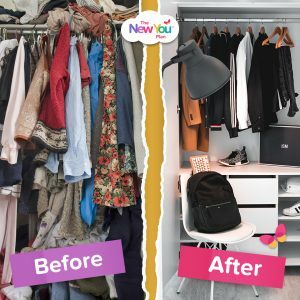 If you have never succeeded in staying tidy to date, then you will find it next to impossible to develop a habit of tidying a little at a time. People cannot change their habits without first changing their thinking! Tidying up in one go brings visible results. The ultimate secret of success is this; if you tidy up in one go, rather than little by little, you can dramatically change your mindset. When I was reading this I was thinking this is exactly why a TFR diet works. I see customers join us who have been struggling at their local diet class, and BOOM within a few short days they see results. 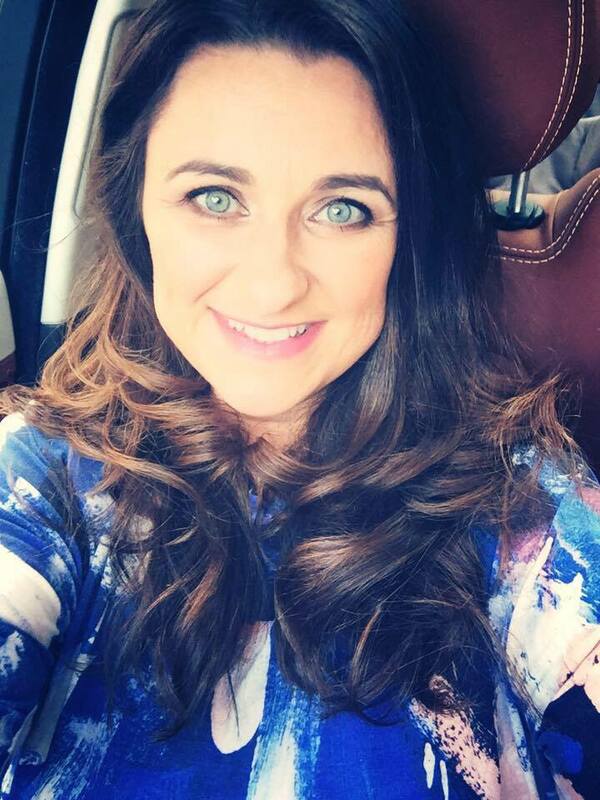 Their stomach is no longer bloated, their energy is improved, they feel happier, and most of all their mindset changes from overwhelm, to confidence, that a new way of life is possible and FAST! “Don’t aim for perfection, start off slowly and discard just one item per day.” Marie Kondo says this advice is given by other people to ease the hearts of those that lack confidence in their ability and that this advice gives people the green light to put things off for another day and not give their best today. It keeps people stuck in a mess! That is exactly why at The New You Plan we focus on 100% TFR diet. It is the best way to get results fast, and to give people confidence. If you want 100% results, then you need to aim for 100% perfection on your TFR Diet. Marie Kondo says that when a room becomes cluttered the cause is more than just physical. Visible mess distracts us from the true source of the disorder. The art of cluttering our space is really an instinctive reflex that draws our attention away from the heart of the issue. When your room is clean and uncluttered you have no choice but to examine your inner state. You can see the issues that you have been avoiding and you are forced to deal with them. From the moment you start tidying you will be compelled to reset your life. As a result your life will start to change. That is why the task of putting your house in order should be done quickly. Tidying is just a tool, not the final destination. The true goal should be to establish the lifestyle you want most once your house has been put in order. WOW, just WOW!! This is what I believe with all my heart about a TFR diet. When you remove food from the equation and you cannot reach for it as an emotional crutch, you have to deal with some issues. So many people when they start The New You Plan TFR diet, are compelled to to reset their life. They don’t just lose weight – they have a complete and total transformation inside and out. Also TFR diet is just a tool – it is not the final destination, and it is a time to really establish new habits and thinking so that you can decide the lifestyle you want to live to support and nourish you once you get to your healthy weight. Rule #4: Don’t Change the Method to Suit Your Personality. Marie researched tidy up methods by personality type; and in the end she boiled it down to the same method for everyone. Keep it simple and it works for everyone. It is the same at The New You Plan and our TFR diet. We keep the method of success very simple. It is called the 4×4 method; 4 TFR diet meals and 4 litres of water. Eat and drink nothing in addition. You cannot get any more simple than that! If you want dieting success then follow the method and don’t try to change it. Marie Kondo says, that tidying up is a special event so don’t do it everyday. This is usually met by stunned silence. Still she repeats; tiding should be done just once. If you think about tidying as an endless chore that must be done every day you are seriously mistaken. There are two types of tidying – “daily tidying” and “special event tidying”. Daily tidying consists of putting things back in their place and will always be part of our lives, but special event tidying should be a one off event. By successfully completing this once-in-a-lifetime task, you will achieve a lifestyle you aspire to and be able to enjoy a clean and uncluttered space of your choosing. Doing one drawer at a time, is not the way to de-clutter your house! It needs to be an EVENT! Something that happens so fast, and with such an exciting transformation that it is like overnight you have stepped in a new world. And it is this feeling of experiencing life at this level, that will keep you from wanting to go back to living in a clutter again surrounded by things that cause you stress and overwhelm. When I was reading this I was nodding my head! Yes this is exactly why a TFR Diet works! It is an event that happens over a few short weeks or months. It is an exciting fast transformation, and it helps people to experience another world. How many people follow the premise of just losing 1 pound a week and actually get to their goal??? This is the advice pumped out by so many so called experts and I personally think it is the biggest load of crap ever. People do not get motivated by losing 1 pound a week, or by decluttering 1 drawer a day. People that start these long drawn out processes do not see them through to the end. That is why the success rate of a TFR diet is so high, because people get to see results fast and they get to experience a different life FAST. If enough thought and consideration is given to how you want your lifestyle to be when you are at your healthy target weight, and you spend your time on TFR setting yourself up for maintenance success, then you will not have to diet everyday. Yes, you will need to look after your body and make sure that it is kept in order, and if you do that everyday…. then the special event TFR diet only needs to be once. What is keeping you from losing weight? I hope you enjoyed me drawing these comparisons from a successful Japanese tidying method to our successful TFR diet plan! These thoughts have just come purely from the first couple of chapters of the book. Living in a cluttered home, and living a life that evolves around too much food and drink, only makes us feel more overwhelmed, which causes us to hold on to more “stuff” and hold on to more “fat”. It is a vicious circle. It will not be broken with a little bit everyday mantra. If you want to see BIG CHANGE IN YOUR LIFE, then make it a special event. Aim for perfection. Reset your life! In a fast period of time you can experience life at your healthy weight, you can step into a whole new world, and create the lifestyle of your dreams. Are you ready to get started on a really, really, really easy diet plan? Thankyou for the motivating blog. Its inspiring and I’m going to keep only what speaks to my heart.